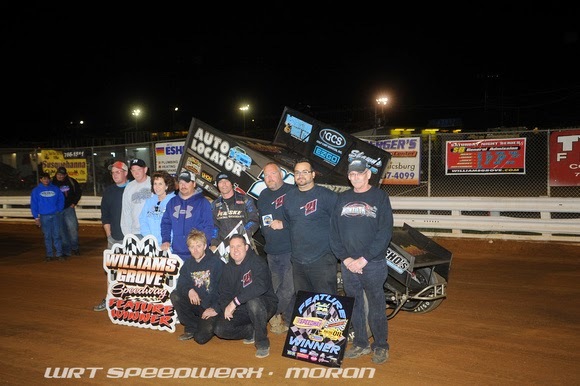 Mechanicsburg – Brian Montieth and Danny Dietrich staged a battle of the high groove titans on Friday night at Williams Grove Speedway in the 25-lap sprint car feature with Montieth coming out on top. For the Phoenixville flyer, it was his third win in four attempts at the track. In the 20-lap 305 sprint main, Tyler Reeser took the lead, lost it and then reclaimed it late to pick up the victory. Dietrich and Montieth started on the front row of the 410 sprint main with Dietrich leading the field down to the line before Montieth took control in the first corner. Dietrich struggled to keep pace with Montieth after he took the lead as the pair entered the backmarkers on the sixth circuit. But as traffic got heavier and heavier Dietrich was able to zone in on the leader and in fact drew onto this tail on a few occasions before finally taking a full blown stab for the win on the 19th lap with a low swoop into the first turn. But Montieth one-upped his challenger and rode his momentum to reclaim control as the pair exited the second turn. It took Dietrich several laps to make up the ground he had lost in the attempt but as the two to go sign appeared he was again ready to go for the checkers. Only this time it was in the third and fourth turns that he pulled the trigger to slide up in front of Montieth for control as the duo raced to the white flag. The pair then raced back to the stripe with Dietrich scored the leader as Montieth drew back to Dietrich’s inside. And then as they raced into the first turn, Montieth turned the tables when Dietrich missed his entry, reclaiming the lead for good as they burst onto the backstretch for the $4,000 payday. However Dietrich kept Montieth honest to the finish, dogging him across the line, finishing second by just .169 seconds. Lucas Wolfe was third followed by Greg Hodnett and Aaron Ott. Sixth through 10th went to Don Kreitz Jr., Stevie Smith, Alan Krimes, Steve Buckwalter and Lance Dewease. Heats went to Hodnett, Buckwalter and Brock Zearfoss with Ryan Wilson taking the consolation. Wolfe set quick time with a lap of 16.932 seconds. James Pryde led on the first lap of the 305 sprint main before he lost the handle in the first corner as Tyler Reeser went for the lead. After spinning out, Reeser assumed command and set the pace until after the halfway point when 10th starter Darren Miller came into the picture. Miller made a two car, second turn pass on the 12th lap to take control, drving by Zach Newlin and Reeser to get command. Miller looked invinceable after getting the lead but with a few laps to go he seemed to pick up a push as his car entered the first corner, allowing Reeser to drive back around to the victory. Newlin rode home second with Steve Storrie finishing third followed by Ken Duke and a fading Miller. Sixth through 10th went to Tom Worrick, Stephanie Stevens, Scott Ellerman, Colby Dice and John Martin. Heats went to Pryde, Reeser and Newlin.